True heart for ministry is unmistakable. Combine that with a love for the Lakota people in Allen, South Dakota, and you have a recipe for a lasting impact. Such is the case with the combined thirty-two years of Native American ministry by two generations of Bentleys. Paul and Kathy Bentley, followed by Barry and Shelly Bentley, dedicated themselves to making a difference in a hope-deprived land among an impoverished people. As they pass the torch of leadership on to home missionaries Tim and Kim Wardell, we pause to bless the Bentleys and remember their steadfast service. Paul and Kathy Bentley didn’t begin their ministry career in Allen. 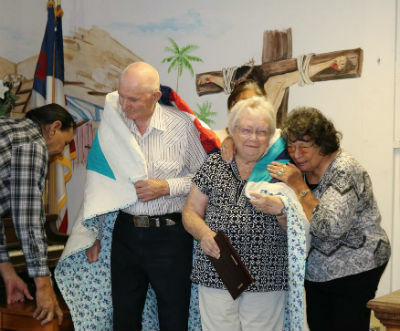 Pastoral ministry in New Mexico, Pennsylvania, Texas, Oklahoma, Minnesota, and finally Rapid City, South Dakota, highlighted the early days of their work. While working at a church in Rapid City, they began offering assistance to Linda and Butch Abold at Wounded Knee. FEWL—the Fellowship of Evangelical Workers among the Lakota—captured their attention. The opportunities for ministry among Native Americans there were as wide open as the countryside. One thing led to the next, as Paul and Kathy became involved with the American Indian Council of the Church of God. By the winter of 1985, they formally began their ministry in Allen, welcomed by temperatures at eighteen degrees below zero and freezing pipes! A ministry that first began in their house ultimately became a haven for adults and children alike. 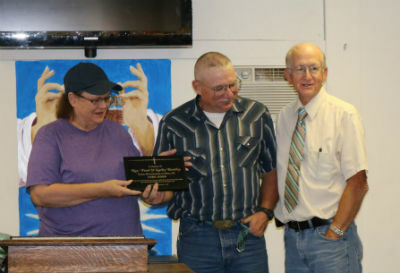 Sherman Critser (far right) presents Barry and Shelly Bentley with an award at the August 19 celebration. And that’s the kind of people Barry and Shelly Bentley would become. Though Barry was born to Paul and Kathy in Texas, he met Shelly while his parents were doing ministry in Rapid City, the community where Shelly grew up. When the two got married, they never would have imagined the course God would have for them, nor the impact they would leave on Native American Ministries in the Church of God. Shelly had some prior experience working with Native American children through the migrant homeless program in the Rapid City school system. That would ultimately come in handy as she ministered to children in Allen, a task she considered anything but a chore. To adults and children, Shelly and Barry demonstrated God’s love in a way that was tangible. James Jackson, son of friends Charles and Kathy Jackson, experienced this love for himself. 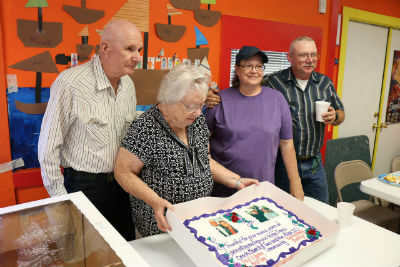 Paul, Kathy, Shelly, and Barry Bentley with their celebration cake. Compassion. Understanding. Dedication. Love. These words and more only scratch the surface of the kind of impact the Bentleys leave behind in Allen, South Dakota. The Church of God is forever grateful. 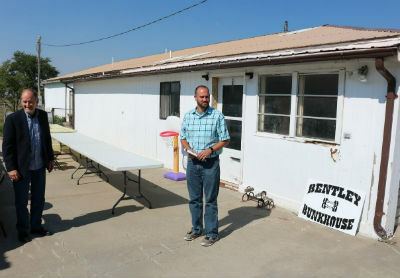 Photo: The Bentley Bunkhouse, dedicated to house work teams at Pass Creek Church of God. To contribute to the continued legacy of the Bentleys at work through Tim and Kim Wardell, visit https://give.jesusisthesubject.org/default.aspx?tsid=8168&fund=188941. Or you can mail your donation to Church of God Ministries, PO Box 2420, Anderson, IN 46018. Be sure to write Project 43.15585 on the memo line to assign your gift to Tim & Kim Wardell – Allen, SD Project. Thank you! This entry was posted in All Church of God, Central, Home Missions and tagged Allen, American Indian Council, Barry and Shelly Bentley, celebration, dedication, domestic ministries, home missions, honoring, impact, Lakota, legacy, Native American Ministries, Nikki Bauerle, Pass Creek Church of God, Paul and Kathy Bentley, Ryan Chapman, Scott Dent, SD, service, South Dakota, Tim and Kim Wardell, tribe. Bookmark the permalink.